BEEEEP. BEEEEP. BEEEEP. We were awakened by our weather radio. Again. A major storm was entering our county, and eye-witnesses reported three tornadoes on the ground. Karl had a few minutes to check the radar before we lost electricity. If the weatherman was correct, then we would be spared a direct hit by about five miles. 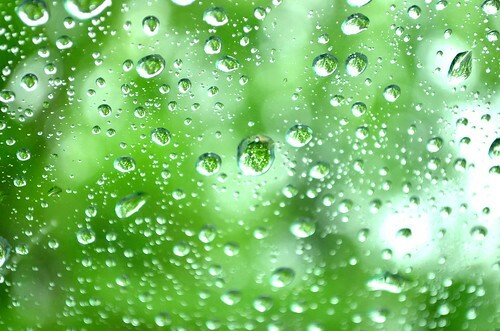 If you look closely, you can see an upside-down tree in the raindrops. Abbey ran into our bedroom. Karl rolled over and tried to go back to sleep. I stood beside a window for the incredible light show. No kidding, the lightning was constant. This tornado season has been one of the most active in my recent memory. I think we’ve averaged at least one warning per week this month. As a result, I’m afraid my children are becoming a little apathetic: they didn’t move when the warning sirens sounded this morning. Maybe they were just enjoying some deep sleep. Abbey, on the other hand, respects the weather. She heard James Spann say something about putting on a bike helmet. She is now wearing hers in anticipation of tonight’s storms (see picture below). Schools are sending kids home. Businesses are closing. Ballgames are cancelled. Churches are canceling activities. It's going to be another long night. Pray for us. Just for fun…you want to know what my favorite gotta-have-during-a-power-outage item is? My headlamp. I look ridiculous, but it’s awesome in the dark. I completely understand Leslie! You are right, we are averaging one a week, and this is the most active tornado season I can remember too. It’s getting ridiculous. It can rain, but no more tornadoes please! And knowing that Tuscaloosa is in that bullseye, well, it doesn’t do well for my nerves or my tummy. God protect and be with us all!! I love storms, but your extreme weather lately has been a little much. Headlamps are awesome, but my favorite are the battery operated lanterns that light up a whole room – and can be turned on low for a safe nightlight. Leslie, I just saw a huge tornado in Alabama on the news. May the Lord keep you and your family safe, and be with all who are in harm’s way. Praying for you. I hope and pray that you folks are okay. We have been going from wildfire warnings one day to tornado warnings the next. Leslie, This must be incredibly nerve wracking! Praying that God will keep you and your family safe.